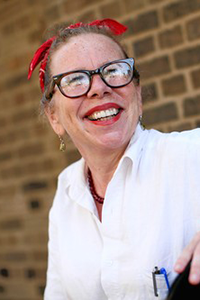 When award-winning cartoonist and author Lynda Barry distributes her hand-drawn syllabus to students on the first day of class, she intentionally skips introductions. In this environment, a student’s academic major, age and even name matter little compared to the topics delved into as a group. Barry’s journey in studying the creative process originally brought her to the university in 2012 as an artist in residence at the Arts Institute. But beginning this fall, Barry will work more permanently on campus as an assistant professor of interdisciplinary creativity through WID and the UW-Madison Department of Art. In addition to engaging with people of all ages in classes, workshops and projects, Barry says she looks forward to collaborating with experts across campus — ranging from the sciences to the Creative Writing program — to further study something she calls the “biological function of the arts.” In other words, what makes us long to be able to sing, draw, write, dance or play music even after we’ve given up on ever being able to do these things well? 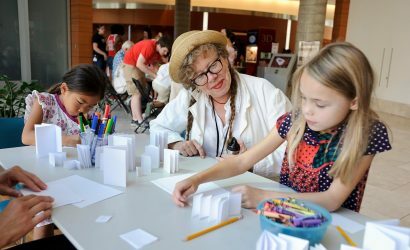 Lynda Barry engaged with people of all ages at a Drawing Jam in April 2013. Participants were asked to draw what schools would look like 100 years from now. This is one of a handful of overarching concepts Barry seeks to understand in a new, flexible WID workspace called the “Image Lab,” located on the northwest corner of the first floor of the Discovery Building. Barry’s lab, which will be open to the public at various times, is dedicated to real-time creative activity that encourages a different take on problem solving. In all of the Image Lab’s activities, Barry’s teaching style in workshops and approach to education are front and center: The focus on mastering a particular subject shifts to giving students the tools they need to fully examine and understand how creativity can enhance critical thinking. Barry’s unique teaching style, described as a mix between boot camp and stand-up comedy, has placed high demand on her courses, which often have a lengthy wait list. This alternative approach to teaching is exactly more of what the university needs, says WID Director David Krakauer. 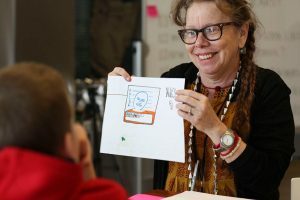 Elementary Visionaries: What will the future of schools look like?